We tend to ascribe seasons to our liquor. Gin in the summer. Scotch in the winter. But happily enough, there’s a species of firewater that, like San Francisco, is independent of these seasonal constrictions. We’re talking mezcal, and the place to drink it is Loló: freshly installed on Valencia and offering a panoply of agave distillations heretofore unheard of ’round these parts. You could sort of say it’s their thing — that and contemporary Jaliscan cuisine in a laid-back (nay, quirky) environment that’s perfect for a casual date. And while the main bar pours shots and cocktails with mezcal vintages never before available in the city, the real gem of the space is its dedicated agave bar. 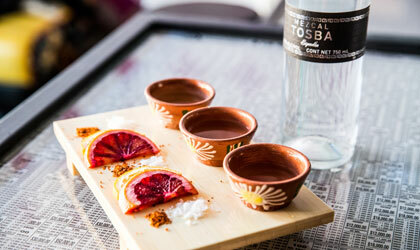 Serving a rotation of flights designed to whet your whistle and raise your alcohol IQ in a single stroke, Loló’s barkeeps will gladly highlight mezcal’s similarities to single-malt scotch and illustrate what separates tequila from the mezcal family tree. It’s as rewarding as educational programming gets. Throw in some oyster and pork chin confit or dungeness crab croquetas — you know, fried rolls — and you’re likely to feel like the most well-rounded man in the room. Because you will be. So study up.